Home / Training Advice / Tenderizing the fresh meat, before they’re even accepted? Tenderizing the fresh meat, before they’re even accepted? 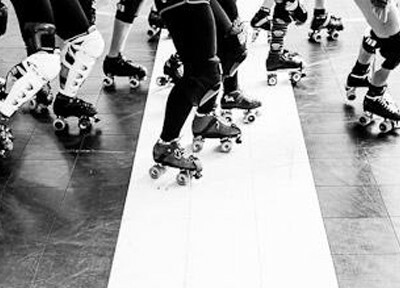 Just went through the latest Fresh Meat intake here at Terminal City Rollergirls. What a treat! An excellent overall skill level – and, warming the cockles of our hearts, lots of *athletes*! Hooray!! We don’t have to spend our next year trying to instill in each of these ladies that her body is her weapon, that the skills will come easier if she has half a quadricep muscle to work with, and that it’s quite obvious that she is not in fact having a skate malfunction, she’s just winded (or worse, lazy)! For the first time ever, we did targeted fitness testing at tryouts. Three tests: a 2-hop-jump (power), a 6-step core test (core strength, basically 6 different styles of situps, 1 rep each, graduating in difficulty), and the Nike SPARQ Yo-Yo Intermittent Recovery Beep Test. The results were illuminating. There is a very wide range of fitness backgrounds, or lack thereof! No one’s scores caused her to be cut, but several people whose skating was weaker were bumped over the bubble because we could tell they would have what it takes to pick up the skills.